All of the Forgotten China jewellery pieces are crafted in Ireland from broken vintage china plates, cups, jugs and sugar bowls. 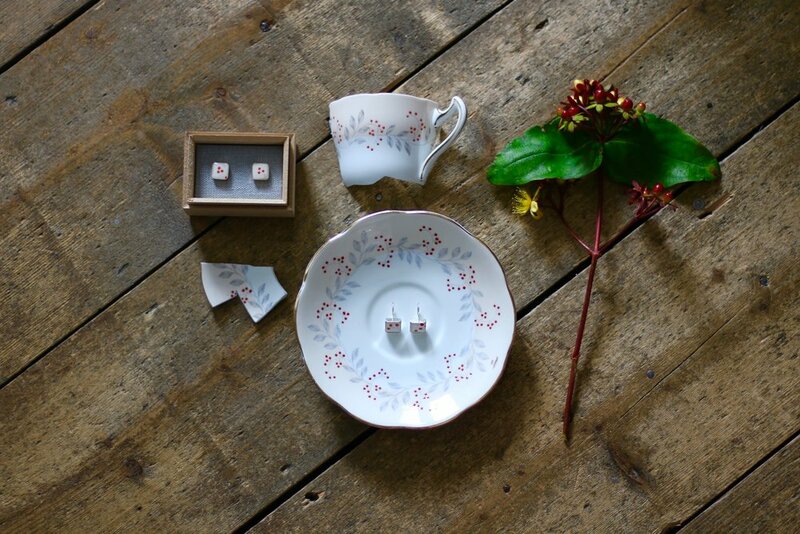 Forgotten China is an award winning Irish business, which rescues old, vintage china from the cupboards of Ireland and gives it a new lease of life in unique pieces of beautiful, upcycled Irish craft! Founded by Julie Swan, Forgotten China takes vintage cups and saucers and turn them into bespoke lighting installations and hand-poured soy candles, plates into cakestands, and cracked or broken vintage china into unique pieces of very special jewellery. Julie scours charity shops and auction rooms across the country for vintage plates, cups and saucers, keeping an eagle eye out for the local, Irish sets that once took pride of place on the dressers of our mothers and grandmothers. She loves how a piece of Royal Tara or Arklow pottery can evoke a distant memory – a Sunday tea with grandparents in the country, or a Christmas spent with favourite cousins – and likes to think that her Forgotten China creations help to keep these special moments alive. As everything is handmade from odds and ends of old – sometimes discontinued – china sets, each Forgotten China piece is unique and there are never more than a few similar items in stock. Julie also takes commissions for absolute once-offs, using customers' own china and tailoring bespoke piece(s) to their personal specifications. You can check out some of her current pieces on the online shop, on the Forgotten China Facebook page or in person, at her weekly market stall in Dun Laoghaire, Co. Dublin. All Forgotten China pieces come beautifully (and securely!) gift-wrapped with free postage for all jewellery pieces. Aloha e Julie, I wanted to write you a follow-up email to let you know that your wearable work of art was a big hit with my wife this Christmas. As soon as the package arrived from Ireland, I immediately wrapped it and placed it under our tree. It wasn't until my wife opened the box on Christmas Eve that I got to see the pieces you sent. They were as beautiful as I had hoped, and looked exactly like the samples on your website. I'd like to say a very heartfelt thank you for what you do. Your work is inventive, unique, and absolutely beautiful. Forgotten China turns beautiful vintage china into works of art. Thank you Julie for your exquisite pieces from my Mum's china plate - 4 pendants, cufflinks and earrings. After Mum passed away in 1989 the contents of her China Cabinet were packed away without us ever knowing what we would do with it. Then, this year, I found Julie and 'Forgotten China'. Today I proudly gave these pieces as gifts to my sister Sandra, nephew and my two daughters - the grandchildren she never met. There were some tears shed! We will wear them with love. Thank you Julie. I love my new ring and have gotten so many compliments since I've been home! Hi Julie, I've been meaning to email you for the last few months to thank you for the beautiful pieces you made out of a china platter which belonged to my Mum. My extremely thoughtful friend, had the wonderful idea of contacting you to see what you could do with the damaged platter, seeing as our attempts to salvage it with superglue failed miserably. The results of your talented labour left me speechless and in tears, the platter was one of my Mum's favourite pieces and I know she would be delighted to see it resurrected so beautifully. I actually saw a couple of your necklaces and earrings at a store in Dublin. I don’t remember the name of the store, but it was in the shopping center near St. Stephen’s Green. I should have picked up a necklace then, because I had a hard time during my whole vacation finding souvenirs that weren’t cheap touristy trinkets - which, to me, are a shameful misrepresentation of the majesty and dignity of Irish culture. Anyway... I ended up coming home with almost no souvenirs. But I remembered your necklaces! Besides being gorgeous in their handmade, up-cycled concept, they reminded me of the bed and breakfast I stayed at for most of my trip, where beautiful china was hanging everywhere! And your logo and packaging are also beautiful and memorable (I’m a graphic designer, so I notice these things!). And the swans are a nice touch too - a reference to your name, I suppose? Well done overall. Amazing bespoke cufflinks from our family antique china - they turned out amazing and Julie was brilliant - everyone loves them! I get lots of requests from people to want to make jewellery, cake stands, candles or lights from their own personal china. Sometimes people get in touch because they have a couple of teacups, saucers or plates left over from a set and they want to do something different and innovative with them, but often it's because they want to pass on their cherished china to a loved one in a new and creative way.